My year-long bread-baking journey has had a rocky start so far — resulting in lots of stale, hard, dense, bread. 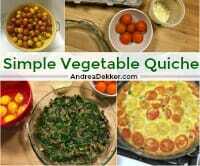 However, I will not waste those ingredients (or my time). 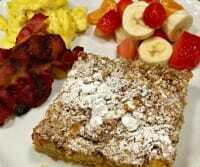 Instead, I make lots of yummy whole grain french toast casseroles! 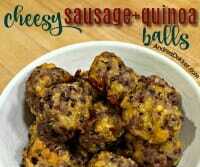 If you’re looking for a great way to use up stale bread, buns, or rolls, try this recipe!! This “recipe” is so ridiculously simple… however, since my goal is to cook, bake, and consume whole grains every day this year, I couldn’t resist the chance to share one of the easiest ways I’ve found to eat more whole grains! 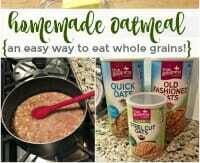 If you’re looking for a super simple, super frugal, hearty whole-grain breakfast, try your hand at homemade oatmeal. 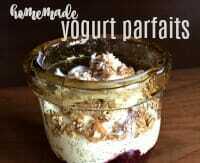 If you’re looking for a tasty treat to add to your breakfast, snack, or dessert rotation, give these yogurt parfaits a try! 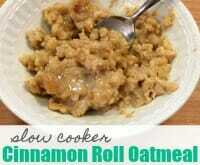 If you’re looking for a really delicious twist to traditional oatmeal, this cinnamon roll oatmeal recipe is for you! You can make it overnight if you want, but if you turn your slow cooker on high, you can have it ready to go in just over an hour! 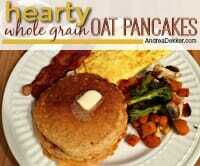 I Made My Pancakes Healthier… and No One Noticed! 5 years ago, I shared my recipe for our family’s most favorite pancakes… and since then, I’ve made this recipe hundreds and hundreds of times. 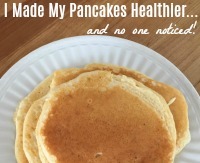 My original recipe isn’t necessarily “unhealthy”; however, last year, I decided to try “healthifying” my pancake recipe just a little tiny bit… hoping no one would notice (and they didn’t)! I’m sharing the 3 little tweaks I made in today’s post!! 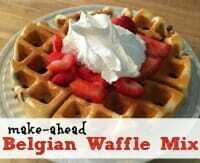 A few months ago, I shared our favorite make-ahead waffle mix recipe. 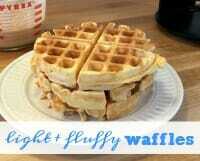 The recipe makes very dense, thick, filling, and delicious waffles. However, if you’re looking for light, fluffy, crispy waffles, I’m sharing THAT simple recipe today! If you’re looking for a really delicious, super easy, one-bowl muffin recipe that is also very high protein, very filling, and a fantastic way to use up overripe bananas… this recipe should work for you! 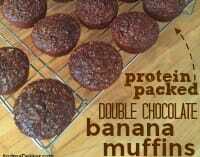 My family LOVES these double-chocolate banana muffins… I love that they are easy to make and full of protein to keep my kiddos full longer! 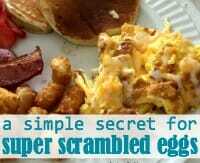 We love scrambled eggs for almost any meal in our house — and I have a simple “secret” to make super delicious scrambled eggs with extra protein, extra calcium, and extra vitamins! 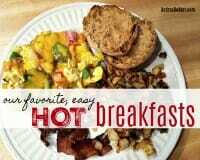 If you like scrambled eggs, you’ll definitely want to read this post! As much as I’d love our children to be satisfied with cereal and milk for breakfast, I just can’t get them to eat it. 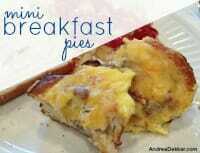 Instead, they request daily hot breakfasts. 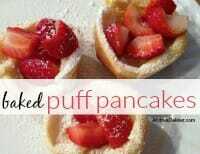 Thankfully, I have an arsenal of hot breakfast recipes, like these fabulously simple Baked Puff Pancakes, that can bake while I get everyone ready for the day! 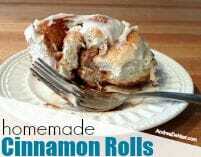 After numerous cinnamon roll conversations with Dave’s mom, searching the internet for various different recipes and tips, and lots of trial and error, I feel like I’m finally starting to find my groove when it comes to making homemade cinnamon rolls. Today I’m sharing my super simple recipe that starts with a loaf of frozen bread dough, uses ingredients you most likely already have on hand, and tastes pretty darn good! I’ve been on a muffin-making kick lately — so when I realized my rhubarb plant had plenty of rhubarb for muffins, I flipped through my files and found my rhubarb muffin recipe. 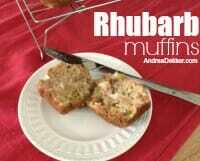 If you’re looking for a quick and simple recipe to use up some rhubarb, give this one a try! 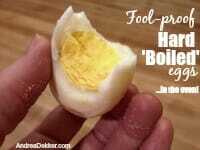 Fool-Proof Hard ‘Boiled’ Eggs… in the Oven! I eat a MASSIVE amount of hard boiled eggs — but I don’t actually “boil” them. This fool-proof oven-baked method is so simple, I can honestly say that I don’t think I’ll ever actually BOIL a hard boiled egg again!